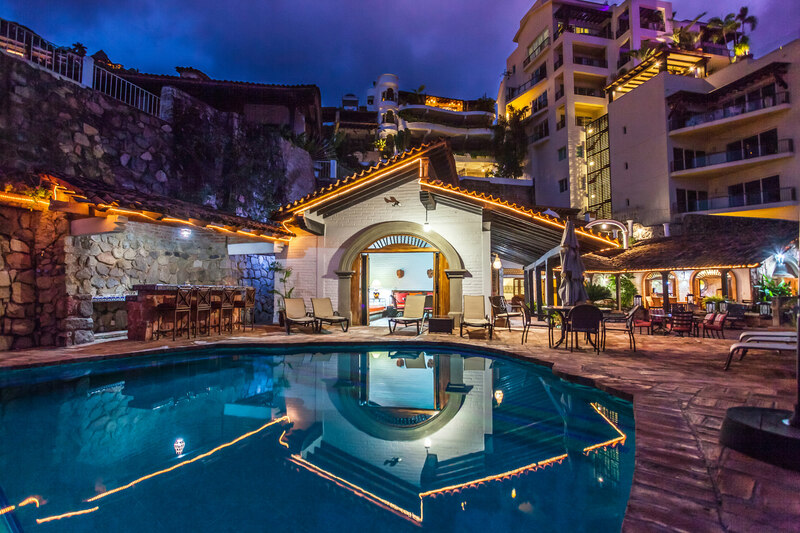 Villa del Mar consists of 2 fantastically located Luxury Villas amazingly remodeled and beautifully decorated just a stone throw from the sand and the waters edge. Featuring 6 Bedrooms all with En Suite Bathrooms and separate entrances, with a stunning fully equipped kitchen with state of the art appliances and plenty of cupboard space for groceries in the main house. The kitchen features a modern stainless steel, glass and polished concrete design. The Villas have gorgeous wood floors throughout, with magnificent soft Persian rugs in all rooms. Adjacent is also a gorgeous dining area for inside dining. Iron and glass folding doors from the kitchen, opens up to a little garden with a fountain and a small Canterra stone table and chair for private relaxation. The fantastic wood-floored terrace has a breathtaking view of the Bay of Banderas (Bay of Flags) and the sunsets from here are incredible and are always different. Certain times of the year the humpback whales come into the bay and dolphins are numerous as well as turtles coming to lay their eggs on the protected beaches. This fully furnished terrace highlights both a large marble table for outside dining as well as an outdoor living room section with a generous sofa, table and chairs for entertaining or reading a good book just up from the Pool and Sundeck area. A powder bath is also located on the deck. Hang out on the loungers by the pool and BBQ or enjoy a good book or take a nap in the old French daybed, buried in soft cushions, or spend some time alone away from the common areas. The splendid kitchen is a cook and entertainer's dream fully equipped with state of the art appliances and everything else needed for the kitchen savvy. The high-end, open design kitchen overlooks the living room where the iron and glass doors fold-away, opening up to the terrace and the bay beyond.